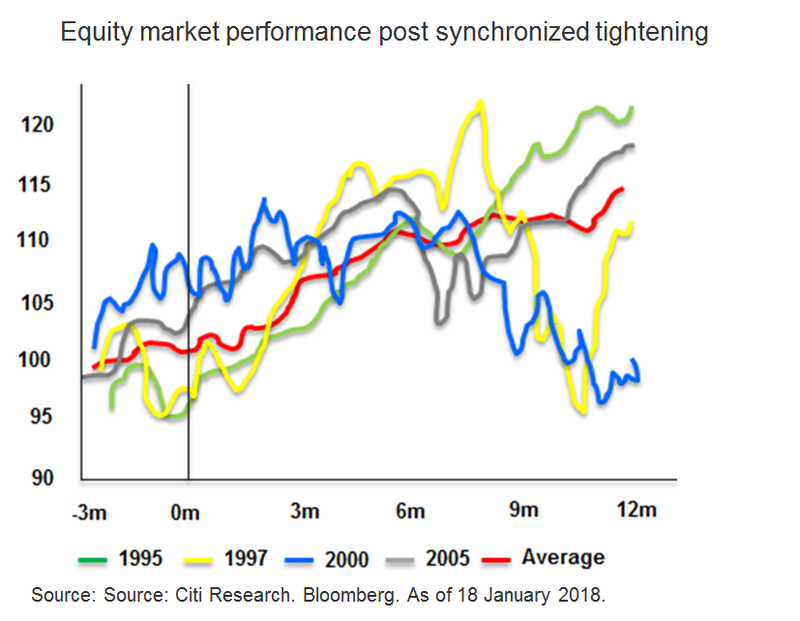 Will Synchronized Tightening Stall the Equity Market Rally? Citi analysts expect the Federal Reserve (Fed) and Bank of Canada to lift rates by 75 basis points each in 2018. At the same time, central banks in Australia, New Zealand, Norway, Sweden and the UK are forecasted to raise rates by 25 basis points each. The Fed will also continue to shrink its balance sheet while the European Central Bank as well as the Bank of Japan will be reducing their asset purchases over the course of the year. Citi analysts looked back to the 1980s to identify periods of synchronized tightening. These were defined as periods where 60% of developed market central banks raised interest rates within a one-year rolling period for at least three consecutive months. Synchronized tightening occurred in 1984, 1988, 1995, 1997, 2000 and 2005. Observing market performance during those periods, Citi analysts note that global equities, as measured by the MSCI World Index, rallied 10% on average in the six months after synchronized tightening, before losing some momentum. See chart. There were exceptions however, although the market corrections seen in 1997 and 2000 were due to the Asian crisis and the bursting of the tech bubble respectively. It appears that risk appetite can hold up during periods of synchronized tightening by central banks. With developed market central banks likely to tighten only gradually in 2018 and to telegraph their intentions well in advance, Citi analysts expect equity markets to trend higher in the medium term on the back of healthy earnings growth, with Europe and the Emerging Markets outperforming.